How to shoot yourself in the foot?! No, I’m not talking about us, developers. I’m talking about portals. It looks like we are going to face another war between the key players in the casual game market. And it starts to look like some portals want to become evil. Big Fish Games is one of the biggest, if not the biggest casual game portal. It’s one of my favorite portals. It’s easy to navigate, delivers wide variety of games, is great to work with and very responsive. They’re not afraid to risk the launch of new genres or not so casual games. There’s just one problem with BFG – their game club which offers games at discounted price of as low as $6.99. But is it really a problem? It looks like other players in the market starts to think so. 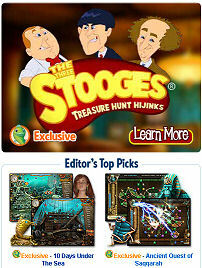 What’s more, Big Fish Games is very successful at getting exclusive deals, mostly short-period. And that’s another thing that bothers other players. Some portals start to send threats to developers – if you give even short-time exclusive to BFG we won’t launch your game. You can read more about it at The good BIG bad FISH exclusive GAMES… in Maciek’s blog. Initially I was very upset about it. But let’s take a closer look at possible scenarios. The end of exclusive deals? If developers take seriously threats of all other portals then Big Fish Games will not have as many exclusives as it has now. Will it help us get more sales? I doubt – other portals will sell your game as they do now, without any extra promotion, and Big Fish Games will not give your game marketing push that would help you sell more games. Will other portals earn more dollars for you if you don’t give an exclusive to BFG? Will be offset possible earning from exclusive deal? But are exclusive deals really a problem for other portals? Do you know how hard it is to launch your game simultaneously on all portals? Do you know how long it takes for portals to accept or reject your game? When I was launching Runes of Avalon 2 guess who was the first to accept my game? Yes, Big Fish Games and… Oberon. The problem with Oberon is that we stuck in the negotiation of distribution deal (I just can’t accept payments after 60 days of receiving money). Who launched the game first? Big Fish Games! Followed immediately by Reflexive. Two month later no other portal launched the game yet and some have all the materials needed to do so. So guys, why are you afraid of those exclusives? You can’t launch games soon enough to compete with Big Fish Games anyway. You say that developers should launch first at portals that sell at full price. Don’t blame us – we usually contact each portal at the same time. That’s your fault that you can’t launch our game soon enough. Or the end of other portals? Let’s say Big Fish Games takes it seriously and to offset possible loss of sales at other portals will give us (developers) a little bit better terms. We don’t get our games on other portals, but get stronger marketing push at BFG. And now comes interesting part – BFG offers exclusives to all top selling games. So ask yourself, smart guy in charge of the portal ABC, what games are you going to launch? All top sellers are already taken! So-so performers? Is it going to help your portal compete with Big Fish Games? I strongly doubt it. Do you think I will cry that my game is not published at smaller portals? Those that according to my publisher reports sell less than 50 copies in the initial month? I will not. If you want to compete with Big Fish Games you better offer better service to game developers. Don’t have them wait 3 weeks for a reply. Provide us better sales. Give players (customers) a reason to pay premium. Do you read game forums, review sites at all? I doubt, because you would not come up with such a stupid strategy if you do. If a game is good, most people comment it: “I can’t wait until it launches at BFG so I can get it via my game club”. If someone is already a member of BFG game club will most probably not buy from others. We already face a huge risk developing our games at our own cost. We don’t want to take part in wars between portals. Don’t be evil, be smart. Read Seth Godin, maybe this will help you find strategy that works instead of strategy that is going to hurt your business. For us developers it is just one more argument to build our own strong direct sales channel. That’s the thing you can count on. It takes time, but time will pass anyway. I agree with your post. If some portals say no to your game due to a BFG exclusive, then it’s no great loss as their sales are rubbish anyway and a BFG exclusive should yield good results due to extra marketing. Yeah BFG can launch games quickly as they have a whole department dedicated to it (they have 300 employees!) whereas it seems like some other companies must just have one person launching games…at least it feels that way. Reflexive rocks too, and Oberon. For me these are the best ones in terms of customer service.